Folks, I just want to give Rush some flowers, to take a moment to thank him for the extremely positive impact he has had on my life and America. I still remember where I was the first time I heard him in the 80s. Who is this loudmouth guy? Where is my regular talk radio host Tom Marr? Shortly after that, I became hooked. The major thing Rush did for me was to define the enemy; liberals and Liberalism. This knowledge opened my eyes to no longer be fooled by liberals' compassionate-sounding rhetoric. Rush educated me to their snooty racist superiority and failed policies, which have devastated lives, particularly blacks', for decades. While I instinctively knew it, Rush articulated why Conservatism is the best and most direct path for everyone seeking to achieve his or her American Dream. Poking fun at the Democrats' encouraging elementary students to have bake sales to help Clinton pay down the national debt, Rush suggested a bake sale for Dan. Rush's idea inspired his millions of listeners, making Dan's Bake Sale an instant international phenomenon. May 22, 1993 upwards to sixty thousand Rush listeners from all over the U.S. and the world gathered in Fort Collins, Colorado to buy a cookie from Dan. The event was a powerful positive illustration of Conservatism. On a personal note, inspired by Rush and led by God, I became the tea party activist I am today. Back in the early 90s, for 15 years I was a graphic designer at a Baltimore TV station recently promoted to department supervisor. Every day I listened to Rush while working. Companies were downsizing, and people were laid off. Rush encouraged them to shift their thinking and view the lay off as an opportunity to pursue their dreams. Well, I bought it. I was not laid off, but did not want to put in another 15 years to retirement. I always wanted a career as a singer/songwriter which I pursued on weekends and vacations. Fired up by Rush's optimism, upon getting the green light from my wife Mary, I gave the TV station my two week notice and began pursuing my dream full time. It was an insane thing to do. I was in my late 40s. Rather than taking you through my entire wilderness experience, we became homeless for six months. During that time, God dealt with and matured me in many ways. As a P.K. (preacher's kid) I grew up hearing people in church say, “Trust God.” For me, it was a Christian cliche. Several times in my wilderness experience when all appeared lost, God came through. Thus, I learned to trust God. Folks, performing at that rally led to being asked to perform at major rallies hosted by Glenn Beck, G. Gordon Liddy and Gathering of Eagles which led to being invited to tour the country on the Tea Party Express. I have been on over a dozen national bus tours with Tea Party Express and other groups which led to my current position as Chairman of the Conservative Campaign Committee. 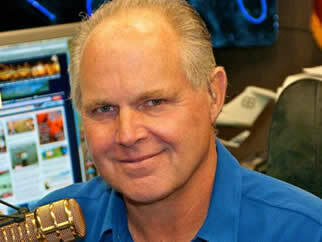 Rush often referenced the American Thinker website. As a writer, my style in the world of politics is somewhat unique. So when AT publisher Thomas Lifson e-mailed that they were publishing my article, Mary and I were ecstatic. That was many articles and a book ago (Confessions of a Black Conservative). Over the years, the Democrats and Liberals won unfair evil victories. Millions of conservatives could hardly wait for Rush to come on the air to bring us back from the edge with his infectious optimism, faith and inspiration. Thus, the thought of Rush not being there was a little unsettling. Praise God, Rush is still on the air. I would like to end my flowers for Rush with one of my favorite Rush parodies. Please enjoy, “Thank the Lord Rush Limbaugh's On” performed by the Rush Hawkins Singers.